The Big Idea: In order to relax and play, children need to feel safe and secure. You can help provide that reassurance and comfort. As a caring grown-up working with children in an extremely challenging situation, your reassuring presence is so important. So much of helping children in immediate crisis is about creating a safe and comforting space (as much as possible). Play is something all children do naturally, and it’s necessary for their overall wellness as they cope with the toughest times. 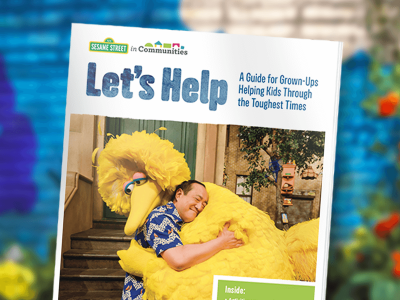 In this guide you’ll find activities to do with children, ways to comfort and reassure them, strategies for making the most of your time together, and important tips on taking care of yourself. You can help children move, make music, and keep learning. You can print the entire guide, or just pages with activities you want to try or with the information you need. Most activities require no supplies at all, and you can use them in any way that suits your needs.